Part 1: Introduction â€“ We showed how to set up tools to interact with Windows Azure. Part 2: Storage â€“ We showed how to setup Windows Azure storage, how to upload vhdâ€™s and some tools to manage storage. Part 3: Networking â€“ We showed how virtual networking works, the advantages of using Cloud Services and how to setup the first virtual machine. Windows Azure assigns a random high port number for the public port that maps to the RDP port (3389). If youâ€™re familiar with NAT in networking, this is similar in concept. Note, this one is not load balanced. So, how do we use this for our SharePoint Farm? To get a load balanced port thatâ€™s publically accessible, we simply define a local port and public port thatâ€™s the same for each VM. For example, we can open port 80 (public) and map it to port 80 (private) for our SharePoint Web Servers. If we do this a second time, Windows Azure recognizes that we want this port to be load balanced against all the virtual machines weâ€™ve specified. Letâ€™s also take a minute to talk about probes. A probe is a method used to check the health of a server, especially in a load balanced set. For example, you may have 3 SharePoint Web Servers but one of them is down. The probe can detect this and prevent users from hitting that server. This is also useful in cases where you just donâ€™t want users accessing one of the servers (to apply updates, letâ€™s say). In this example, weâ€™re asking Windows Azure to use the â€œhttpâ€ protocol on port 80 and target the iisstart.htm page. For this to work, the machine much have a website at that path thatâ€™s alive. If not, the probe will fail and users wonâ€™t be routed to that machine. For our scenario, weâ€™ll keep the IIS â€œDefault Web Siteâ€ to use for probing purposes. Hopefully you can still connect. Next, weâ€™ll assign some values to our account variables as we did before. Remember to use the values you got when you ran the last command. 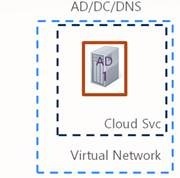 $subscriptionName = "Windows Azure Internal Consumption"
$serviceDesc = "Cloud Service for SharePoint Farm"
Next, weâ€™ll specify a few availability sets. Think of availability sets as a way to configure high availability. Weâ€™re telling Windows Azure that VMs in an availability set have the same role. This instructs Windows Azure to put these VMs on different racks and/or different servers to avoid any single points of failure. Specify a location for these VMs. Iâ€™ve created a folder under my â€œvhdsâ€ container called â€œArchâ€ and I want these VMs to go there. The next thing weâ€™re going to specify is the VM configuration. Since thereâ€™s a lot going on in the next set of PowerShell scripts, let me explain. The $size variable is self-explanatory. Iâ€™m going to use â€œLargeâ€ which gives me 4 cores and 7 GB of RAM. The recommendation here is to use smaller VMâ€™s that you can scale out (my adding more), rather than Extra Large VMs. You pay for compute hours based on the size, so many times several smaller ones are better than fewer larger ones. For $vmStorageLocation, weâ€™re going to specify the $mediaLocation above, plus a name for the vhd. If you uploaded VMâ€™s use the name of the vhd you uploaded. $vmStorageLocation = $mediaLocation + "Arch-SPWeb1.vhd"
Note: If youâ€™re creating new VMs, rather than using uploaded VMs, make the following changes. Â§ Change â€“DiskName $vmStorageLocation to â€“ImageName $spimage (or $sqlimage for the SQL servers). We can copy the above set of commands as a template to build out our farm. In my case, Iâ€™ve got another SharePoint Web Server, a SharePoint App Server, and an Office Web Apps server. $vmStorageLocation = $mediaLocation + "Arch-SPWeb2.vhd"
$vmStorageLocation = $mediaLocation + "Arch-SPApp1.vhd"
$vmStorageLocation = $mediaLocation + "Arch-WAC1.vhd"
$vmStorageLocation = $mediaLocation + "Arch-SQL1.vhd"
Hit Enter and away it goes. If you run into any problems, Iâ€™ll try to cover the ones Iâ€™ve encountered in the next article. If everything went smooth, youâ€™ll see something like the screenshot below. This will take a few minutes, sit back and enjoy some coffee or something. In my demo, this was taking a while on the second VM and I really wanted to hit CTRL+C or something, DONâ€™T â€“ just be patient.